Building a custom home means that you can custom select every element of your home, including lighting. 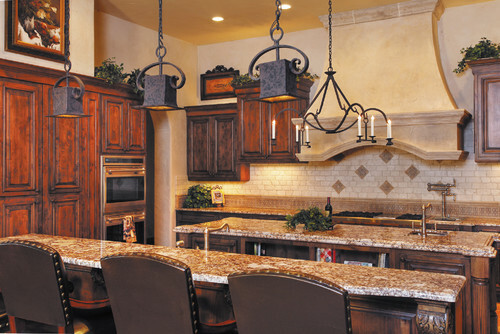 Whether recessed or a pendant style, lighting elements can help you create atmosphere for every room of your home. Here are four of the hottest trends in lighting that are sure to inspire your luxury custom home design. Old world, rustic country design is a popular choice for luxury custom home building today. Blending the handcrafted elegance of the Mediterranean and the distressed, natural charm of country living, this classic style brings a warm and inviting feeling to any room. Lighting in pewter, iron or stone go beautifully with the rustic design style. Distressed metal sconces and hanging lights modeled with simpler, geometric shapes give kitchens, studies and baths an immediate feeling of familiarity. Looking for a little extra artistic flair for your rustic design? Lights designed to incorporate wood or glass provide an additional element of texture and a serve as a wonderful focal and conversational piece. Post-modern design, based on the concepts of the modernist movement of the late 19th century, incorporate clean, straight lines inspired by the bold colors and designs of abstract art. Found in many of today’s most upscale hotels, the modern style of design has become a symbol of elegance and luxury. Building a modern custom home often includes lighting fixtures with clean lines that will fade seamlessly into the background. This provides functionality without taking center stage in the overall design. Natural fibers of cotton or linen are ideal for lamp and chandelier coverings, while the simplicity of stainless steel and chrome provide the perfect finishes touches to fixtures. One of the hottest trends in luxury custom homes today is the layered lighting design look. Often created out of stain glass or hand-blown glass, this style brings a mixture of color and textures into common lighting elements. Perfect for game rooms, kitchens or rooms for formal entertaining, the artisan style of layered lighting gives an element of polished sophistication through ceiling fan shades, mini chandeliers and sconces. Polished nickel and chrome has become a staple in contemporary design. Originally found in the kitchens of France, chrome and nickel are now essential for today’s gourmet home cooks and foodies. Large hanging chrome lights with adjustable, locking arms allow for ample lighting in the kitchen exactly where it is needed. 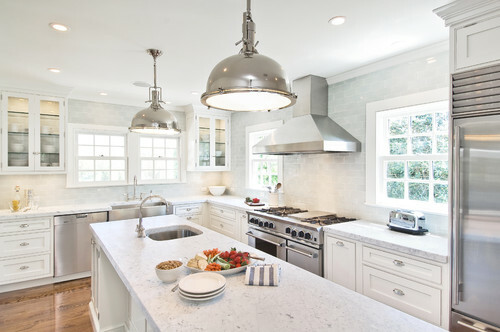 Polished nickel fixtures for the sink and cabinetry pull together the ultimate culinary kitchen design feel. When working with your Des Moines home builder to create your new luxury home, remember to plan for lighting and fixtures. 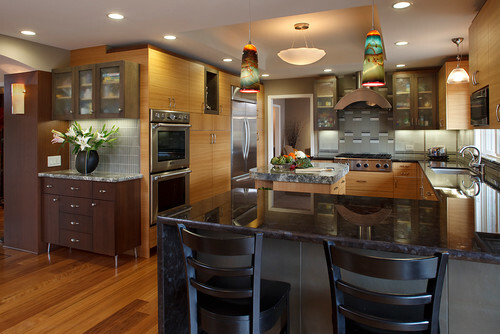 These top trends in lighting not only provide functionality, but also compliment and complete any luxury home design. For more great planning and design ideas, download our free planning guide.